Blue’s ArtHouse has finished a fourth website for Combined Manufacturing, manufacturers of the popular EZ-POUR Replacement Spout. They’ve been inventing again! 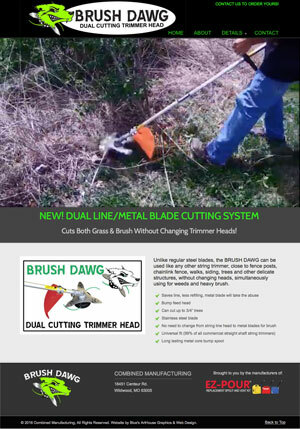 This time they’ve built a powerful lawn and garden trimmer head that combines both trim line and a metal blade, the Brush Dawg. This bad boy can be used like a regular lawn trimmer but can also clear the thickest brush simultaneously without changing the trimmer head… very handy! Blue’s ArtHouse also worked with them to create their fun logo design and we are also designing their packaging and operators manual.